Расположен колледж в центральной части южной бухты Лос-Анджелеса, которая включает в себя девять городов: El Segundo, Manhattan Beach, Hermosa Beach, Redondo Beach, Torrance, Lawndale, Hawthorne, Lennox and Inglewood. Отсюда до международного аэроопрта Лос-Анджелеса (LAX) всего 15 километров. Обучение в EL CAMINO COLLEGE...обеспечит Вам поступление в ведущие ВУЗы Калифорнии! Это UC Los Angeles, UC Berkeley, UC Irvine, UC Santa Barbara, California State University, University of Southern California, Pepperdine university. Перевод в топовые американские университеты. Прекрасное месторасположение, отличная погода и безопасность обеспечены. 7 минут езды от Тихоокенского побережья, 10 минут от аэропорта LAX, 30 минут от Голливуда, Санта-Моники, Беверли-Хиллс, Диснейлэнда и многого другого. Теплый и комфортный климат в течении всего года. Доступные апартаменты в 5 минутах ходьбы от колледжа, проживание в семьях р и резиденциях. Intensive English Language Program- Программы подготовки к успешной сдачи экзаменов TOEFL с последующим успешным зачислением в EL CAMINO COLLEGE. Certificates: Students can earn certificates in a wide range of technical, occupational, and arts programs. The majority of the certificate programs are 18-30 units, which typically take 1 to 1½ years to finish. Associate of Arts (A.A.) and Associate of Science (A.S.) degrees: To obtain an A.A. or A.S. degree, students need to complete 60 units of coursework. This includes completion of appropriate general education courses and no fewer than 18 units will be within the student's major. In addition, coursework toward the degree must be completed with a minimum grade-point-average (GPA) of 2.0, or a "C" average. 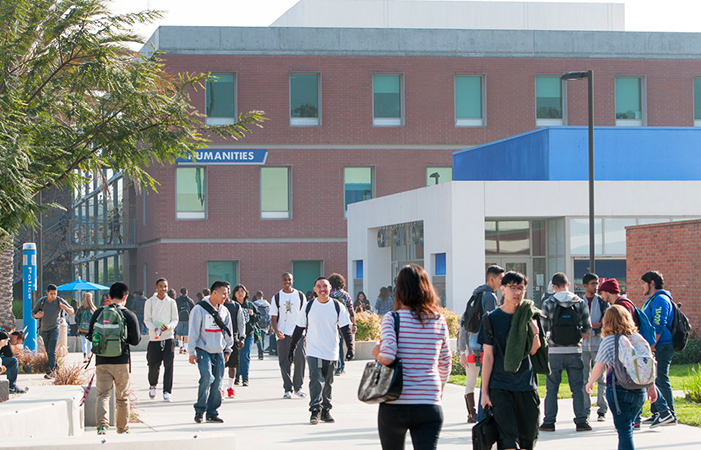 Transfer opportunities:El Camino College is nationally known as a leading transfer institution to major universities in California and throughout the United States, including top-notch universities such as UCLA, University of California at Berkeley, University of California at Irvine, and USC. The College also has Honors Transfer agreements with UCLA, University of California at Irvine, University of California at Riverside and California State Universities at Dominguez Hills and Long Beach.